Discussion in 'UFC Discussion' started by Woody1975, Dec 30, 2012. Finishing an opponent so he is incapable of continuing is better than a decisive decision. Getting caught vs. being consistently beaten? AMEN -- they his slanderers aka cain's nuthuggers don't like being force fed humble pie that way. Stop crying.. They will fight again.. I respect JDS too much to do that. Say what you want, I remember hearing JDS saying how he was literally afraid of Cain before there first go round and how much respect he had for him. After KOing him I think he felt a little over confident that he can impose his will in the rematch. I feel like for their third fight he will be deep down always scared shitless because he knows that despite having the finish on Cain, he knows what awaits him if he can't connect clean. For the record like both fighters rooted for Velasquez. Stop it. 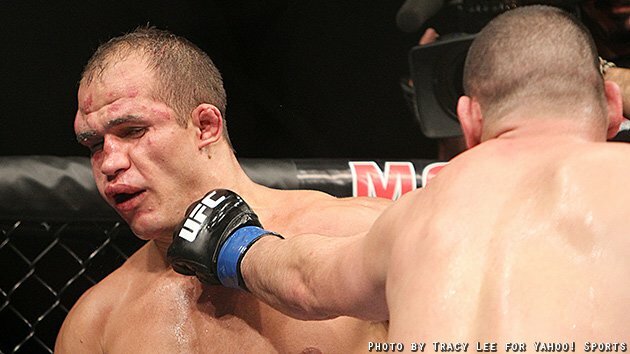 Cain destroyed JDS, a gif won't change that. lol, if this was GSP everyone would be going mad that he didn't finish. Can't rely on a lucky punch every time. Big Cigano fan, but damn; that GIF is disturbing. Everyone knows that a finish in the very first minute of the fight isn't a true finish.